Flaking concrete and scaling concrete occurs when new concrete floors are being installed and the temperature is cold and / or too much moisture is present. It usually causes the top layer of industrial concrete to easily break off from the flooring system. When flaking and scaling begins to occur, Concare will evaluate your flooring system to determine the extent of the damage. Flaking and scaling may occur in small sections, or may consist of the entire concrete flooring system, depending on the previous installation. Once we determine the cause, we will bring your industrial concrete floor to the level of strength and durability your business deserves as every aspect of your facility contributes to the bottom line profitability of your business. 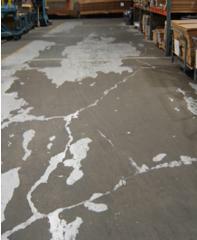 Contact Concare today to repair flaking concrete and scaling concrete in your industrial concrete floor.